Looking for the right Flash Array for you? Tired of all data being treated the same but want to save time and budget? Flash storage is helping to address the latency inherent with disk drives, enabling you to virtualize more, and reduce application response times. It's an inescapable fact that the $/GB of flash is much higher than disk drives. So why do the majority of storage vendors indiscriminately accelerate all data, regardless of its value to your business? 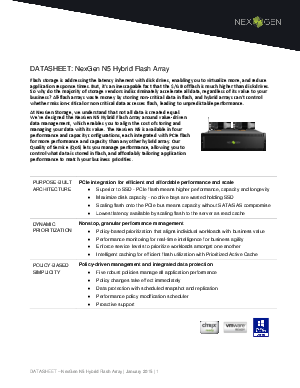 All-flash arrays waste money by storing non-critical data in flash, and hybrid arrays can't control whether mission-critical or non-critical data accesses flash, leading to unpredictable performance. So what do you do to find a solution that addresses both of these issues? Download now and see NexGen's approach to value-driven data management. Make it simple to control what data is stored in flash and affordably tailor application performance to match your organizations priorities now!